I’m very much Team Darlington but even I have to admit that there isn’t always enough to satisfy my word-nerd soul. I’m also happy to admit that that might have something to do with how greedy I am about bookish events, but that is getting away from the point. The point is that Darlington for Culture are doing what they can to help my insatiable desire for such things. 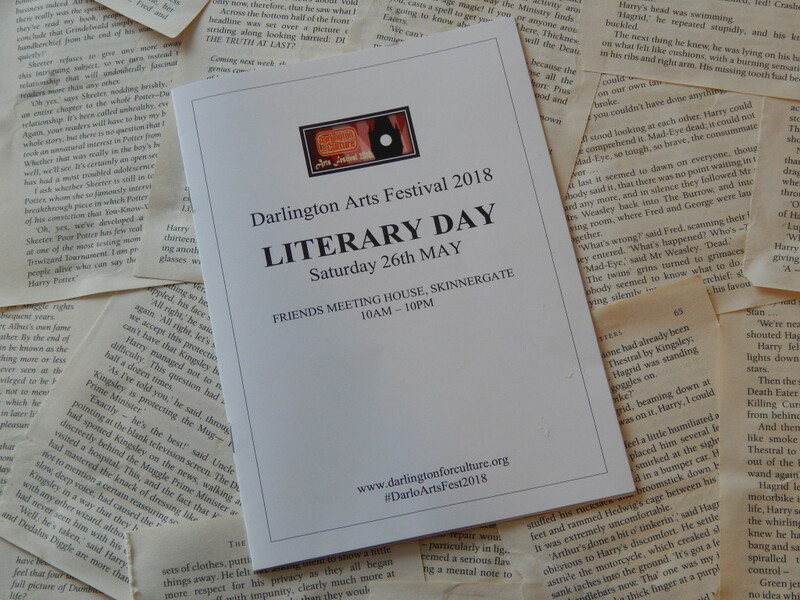 Somehow, they have heard my pleas and are delivering not only a Darlington Arts Festival, but an entire Literary Day! It’s so much easier not to have to travel for such awesome events. Who doesn’t love having a chance to be a word-nerd in their hometown? Plus, I’m looking forward to not having to get up for an early train! It will be a super affordable day! A lot of the events that are happening during the day are free and the rest are between £3 and £7. Even if you decided to pop along to quite a few of them, the cost shouldn’t rack up too much. There’s a huge range of events on offer. From poetry to self-publishing and a stop at play script readings, there’s loads to choose from. I’m seriously tempted by the Vane Women Creative Writing Workshop, the session on Plotting a Short Story and I will be at the Inkerman Street book launch, which is on between 5 and 6pm. It’s a chance to meet like-minded individuals. I always get nervous before events like this but then end up loving them. It’s so much fun to chat to people who also love books, writing and all things literary. Popping along supports the local arts scene. It’s quite simple really: if I want to see more arts and culture events in my area, I need to show my support to great organisation like Darlington for Culture who are doing what they can to deliver them! I honestly cannot wait for this. I squealed with excitement when I finally got a chance to see the brochure and the plethora of wonderful events that it contained! Will I see you there? If you are after more information, your best bet is to head over to the Darlington for Culture website, which you can find here. This sounds great. Thanks for the post. Can you please provide a link to the events/agenda? I can’t seem to find it on the DFC page.